Some of our customers have a mixed election where most voters vote online via a link in a voting email but some voters vote via a postal ballot. When you have such an election, you need to combine the online votes with the postal votes and then count the combined votes. In this post, we explain how you can do that with OpaVote. We provide two options, and you can pick which works best for you. OpaVote provides three types of items: (1) an Election, (2) a Poll, and (3) a Count. With this method, you will create an OpaVote Election for your online votes, and then create an OpaVote Count to combine the online ballots with the postal ballots (you won't use a Poll). Create an OpaVote Election for all of your online voters. See the OpaVote Help menu for more details about how to do this. When the election is over, click the "Download Ballots" button to get the online ballots. The default name of the file is "ballots.txt", but you should change this to a more descriptive name, such as "online-ballots.txt". The ballot files are just plain text files that you can open in any text editor (you can also view them in the Chrome browser). If you need help looking at the contents of a ballot file, contact your local tech guru. Send paper ballots to your postal voters and get the completed postal ballots back. We recommend numbering the received postal ballots to make it easier to audit the ballot entry process. 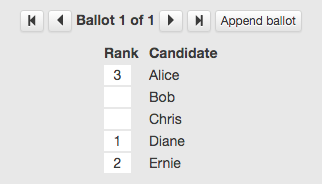 First, in your Count, click the "Edit Ballots" button to bring up the ballot editor. Then enter the postal ballots in the order that you numbered them. Double check to make sure you entered them correctly! Second, after you have finished entering the postal ballots, use the "Download" button to save the postal ballots. Again, the default name is "ballots.txt" so you should rename it to a more descriptive name, such as "postal-ballots.txt". You could skip this step, but we think it makes the auditing process easier. Third, use the "Append Ballots" button to append the online ballots to the postal ballots. After clicking the button, you simply select the file containing the online ballots. Fourth, double check that you have done the above steps correctly. If you make a mistake and need to redo it, then you will need to start over again (which may require another payment). Fifth, select your desired counting method, and then count the votes. If desired, you can share the link to the results with others. I'll now go into a couple variations of the above process. To make sure that you enter the postal votes correctly, you could have two different people do the first step, and make sure that the two ballot files are identical. You'll need a local tech guru to help you determine if the two ballot files are identical. You have another option that is a little simpler than the above process, but may be harder to audit. As above, create an OpaVote Election for your online voters. When setting up your Election, include a "code voter" for each postal voter (see the Help if you need more details on this). We recommend downloading the codes and adding them to a spreadsheet alongside the name of each each postal voter. You now know have two options for entering votes for a postal voter. First, for each postal voter, you can send them their code via post along with the website address of your election (something like https://www.opavote.com/vote/1234). The postal voter could then go to that address, enter his or her code, and enter his or her vote. Second, you can send a paper ballot to each postal voter, receive the paper ballot back, and then enter the postal ballot yourself using the assigned code. You simply go the election website, enter the voter's code, and then enter the vote on behalf of the postal voter. Note that you need to trust the person entering ballots this way not to cheat! Because ballots are anonymous after they have been entered, there is no way to later determine whether the ballot was entered correctly. For this reason, we prefer the Election then Count method above. You could even mix the above two options. You can allow a postal voter to enter the vote online or send it back via post. Since a code can only be used once, there is no danger of the ballot being counted more than once. Make sure that you keep the codes confidential! Anyone with the codes can use them to enter votes. If you put the codes in a public place, it is easy for someone to use them to cheat.